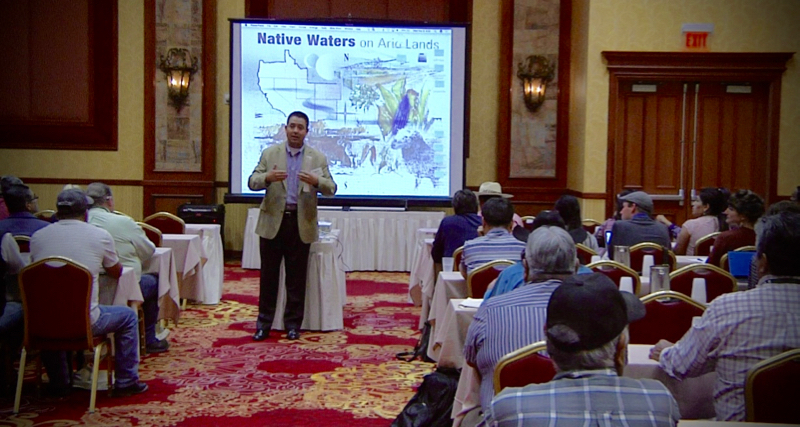 On November 9-10, 2016, more than 100 people gathered at the South Point Hotel Casino in Las Vegas for the second annual Native Waters on Arid Lands (NWAL) Tribal Summit. Conference speakers and other attendees came from communities and reservations located across Arizona, Nevada, Colorado, California, New Mexico, Utah, South Dakota, Montana, Wisconsin, Georgia, and Ohio to share in two days of workshops and talks related to water resources and climate change on tribal lands. On Wednesday, a pre-conference breakout session introduced Summit attendees to a series of climate change projections for nine reservations in the Southwestern US, and presented an overview of the climate adaptation programs, trainings, resources and funding opportunities that tribes may access through the Bureau of Indian Affairs (BIA) and Institute for Tribal Environmental Professionals (ITEP). Joe Jojola from the Bureau of Indian Affairs speaks at the NWAL Summit’s preconference breakout session. Nov 9, 2016. The conference formally opened with a blessing from Clayton Honyumptewa of the Hopi Tribe, and an overview of tribal water rights by Heather Whiteman Runs Him. Whiteman Runs Him is a staff attorney for the Native American Rights Fund in Boulder, CO, and discussed several foundational cases in tribal water rights, approaches for quantifying rights, emerging issues, and case studies from different reservations. Heather Whiteman Runs Him speaks about Tribal Water Rights at the 2016 NWAL Summit. Nov 9, 2016. 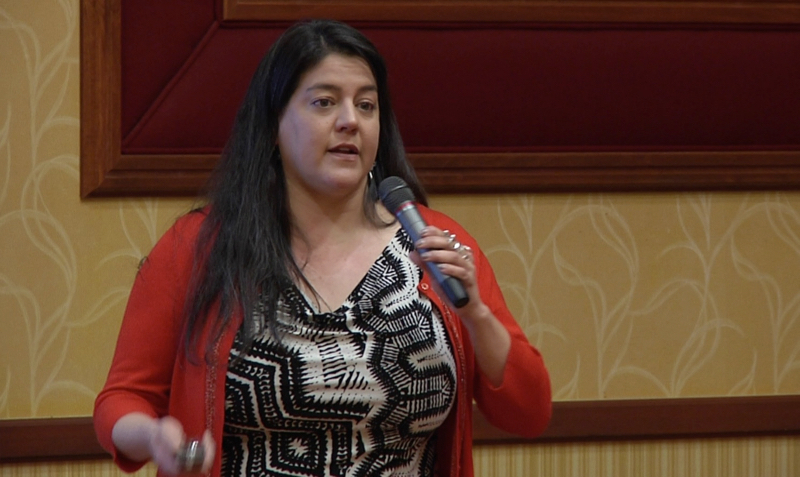 During the two-day conference, a series of breakout sessions covered a variety of topics related to the use of tribal water resources in a changing climate. Speakers included representatives from the Agua Caliente Band of Cahulla Indians, Ute Indian Tribe, Gila River Indian Community, Yerington Paiute Tribe, Pyramid Lake Paiute Tribe, Duck Valley Shoshone-Paiute Tribe, Jicarilla Apache Tribe, Colorado River Indian Tribes, Hopi Tribe, White Mountain Apache Nation, Pueblo of Zuni, Navajo Nation, and the Salt River Maricopa Indian Community (the full program for the 2016 Tribal Summit is available here). The first breakout session, titled “Groundwater and Surface Water Relationships Affecting Reservation Environments,” explored challenges related to water rights and water quality on tribal reservations. Some presenters discussed ongoing legal disputes related to groundwater and surface water rights, and methods for quantifying those rights. For others, problems related to pollution and chemical contamination of water sources were of more immediate concern. 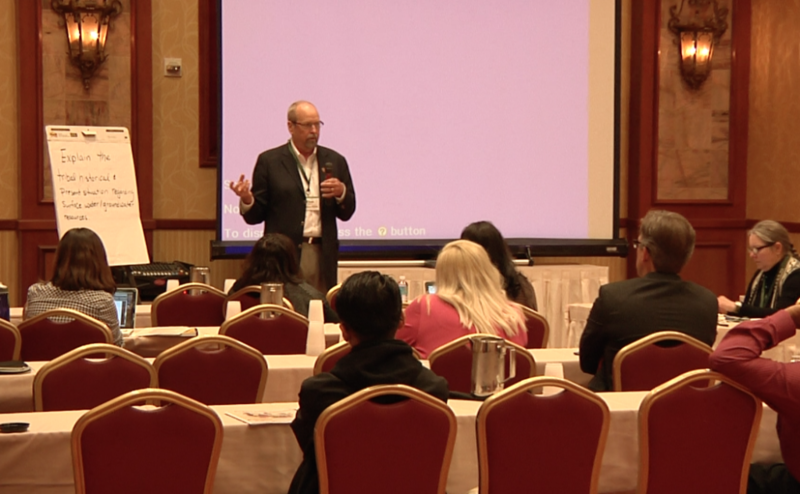 Tom Davis, Chief Planning & Development Officer for the Agua Caliente Band of Cahulla Indians (Palm Springs, California) speaks during the first breakout session. Nov 9, 2016. The second breakout session, “Invigorating Tribal Economies through Innovative Water Resource Use,” focused on new ideas and opportunities for using tribal water resources in economically beneficial ways. Examples discussed by the session speakers included fisheries projects, water leases, and improved water conveyance/delivery structures for agriculture. One key theme that emerged from this session was that is important for tribes to secure and quantify their water rights in order to effectively manage water resources to invigorate tribal economies. 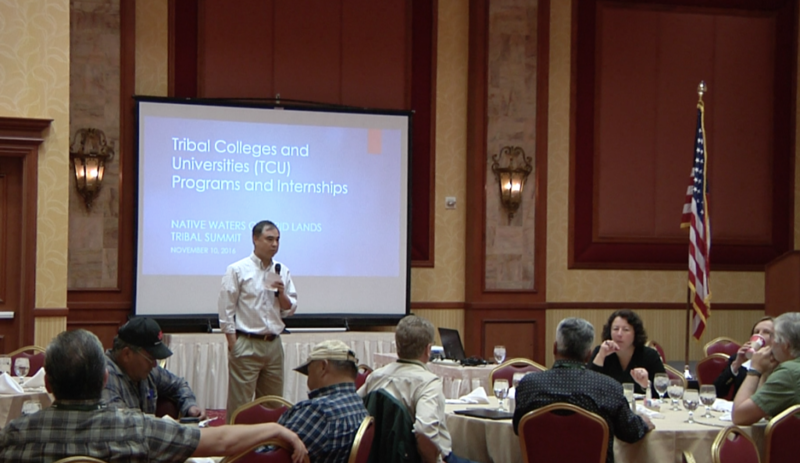 The second day of the Tribal Summit began with a presentation about Tribal Colleges and Universities (TCU) programs, and an overview of the internships and opportunities that are available to students who are interested in hydrology, water resources, range management and other disciplines. John Phillips (FALCON) presents information on Tribal Colleges and Universities programs and internships. Nov 10, 2016. 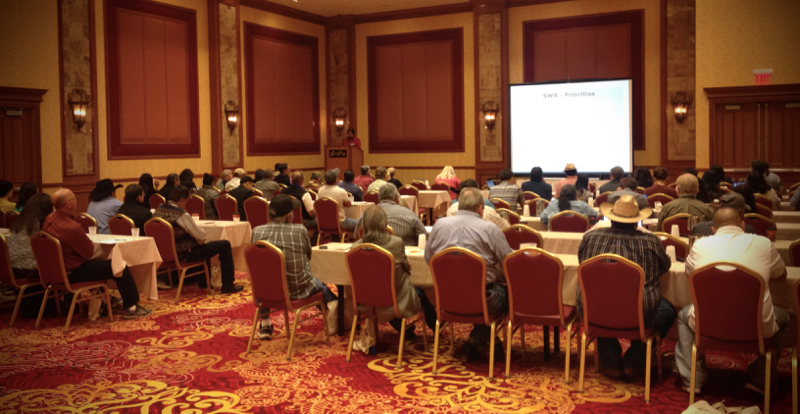 A breakout session titled “Tribal Rangeland and Livestock Conservation Practices,” introduced attendees to challenges faced by ranchers on tribal lands, such as land tenure issues, rangeland habitat degradation, and funding cuts. To deal with these challenges, presenters discussed solutions such as habitat conservation measures, water pipelines, livestock associations, livestock inventories, impoundments for capturing feral and escaped animals, range management plans, a traditional fisheries recovery project, and more. A breakout session titled “Traditional Knowledge and Ecology” explored best practices in Native American agriculture for climate resiliency that incorporates traditional knowledge. 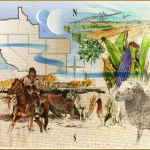 Speakers from the Hopi Corn Project, the Black Mesa Water Coalition, the Zuni Project and the Salt River Pima Maricopa Indian Community Garden discussed projects that utilize and adapt traditional knowledge for modern-day agricultural practices. During a session titled “Traditional Knowledge and Ecology”, presenters discussed projects that combine modern and traditional knowledge in agricultural practices. Nov 10, 2016. In a lunchtime talk, Chairman Harold Frazier of the Cheyenne River Sioux spoke about opposition to the Dakota Access Pipeline at the Standing Rock Reservation in North Dakota, and the potential impacts to sacred grounds and water resources. 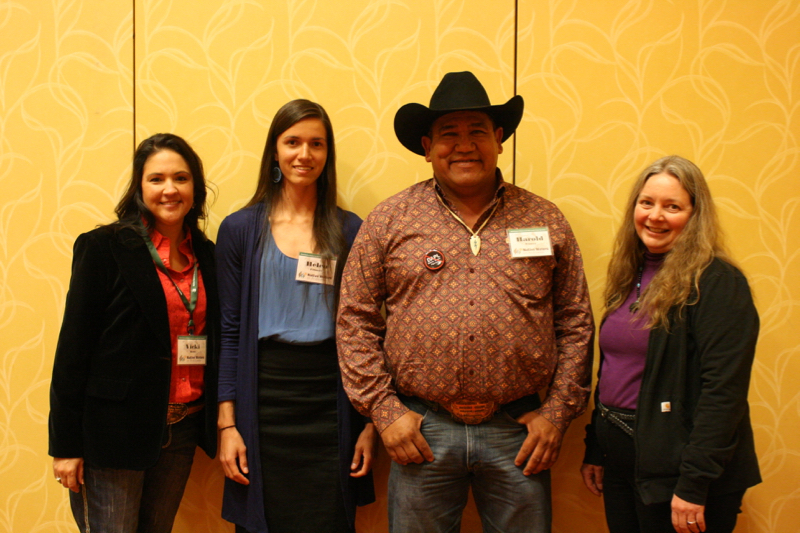 Left to right: Vicki Hebb, Helen Filmore, Chairman Harold Frazier (Cheyenne River Sioux) and Maureen McCarthy at the 2016 Tribal Summit. Nov 10, 2016. A final synthesis session led by Native Waters team member Derek Kauneckis of Ohio University asked participants to share insights regarding key takeaways from the Tribal Summit. The Summit closed with a blessing from Robinson Honani of the Hopi Tribe. An in-depth report on the proceedings and outcomes of the 2016 Tribal Summit is available here. 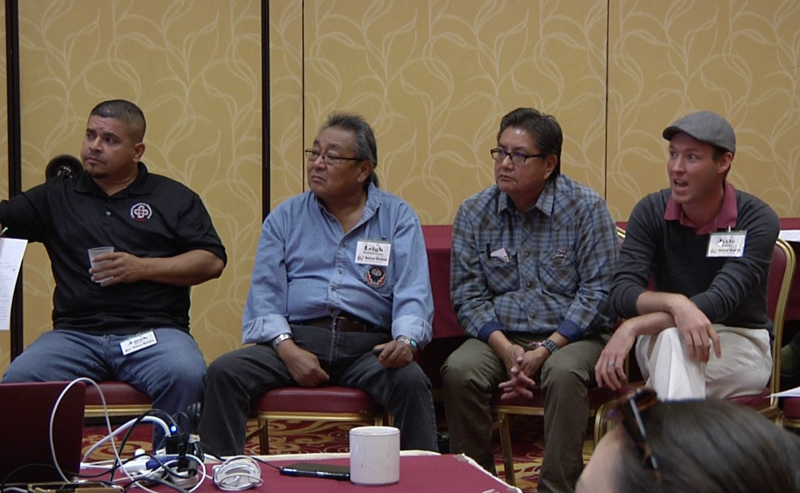 The Native Waters team would like to thank everyone who was able to join us in Las Vegas. We hope to see you again next year!